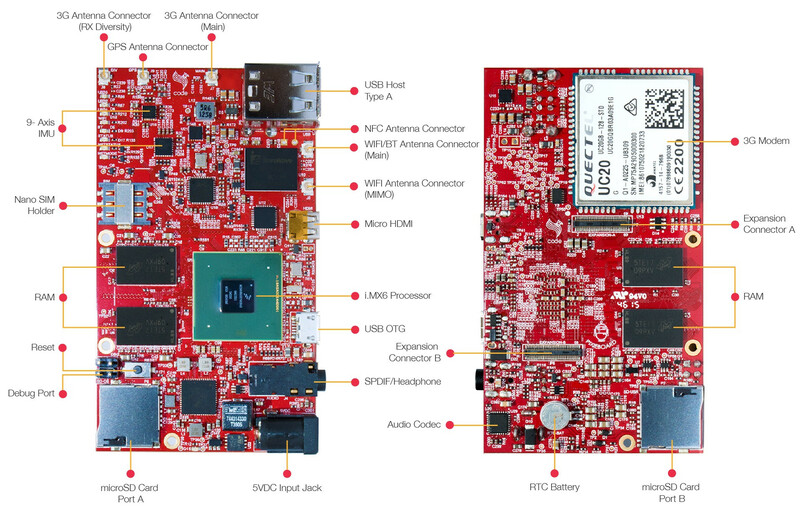 Saying that the market now provides a wide range of development boards is probably an understatement, but Code Ing has found out that most hobbyist boards had limited on-board wireless connectivity with WiFi and Bluetooth basically the best you could expect, with any extra wireless functionality requiring USB dongles. So the company designed PixiePro single board computer powered by NXP i.MX6Q quad core Cortex A9 processor with on-board wireless connectivity including WiFi 802.11ac, Bluetooth 4.2, GPS/GLONASS, NFC and a 3G module. Since the two expansion headers are not exactly convenient for experimentation, the company will design a low cost adapter called PinsBoard that will fit into the 60-pin connector and provide a Raspberry Pi compatible header. The board currently supports Arch Linux ARM, and they have a Wiki with some documentation, including guides for WiFi, Bluetooth and 3G, as well schematics in PDF. You can also get support via their Forums. The board was first showcased at FTF 2015 last year, where it was called PixieBoard, so there should already be some out in the wild. The company has launched the board in mid December for $99.50 + shipping, which unless you are based in the US, will add $30 to $50 to the cost. You can find all details on Treats4Geeks.com. Thanks to Guillaume for the tip. How quickly Freescale imx6 has turned into NXP’s.) I even got confused for the instant. Well, as always with the freescale’s chips – too expensive and nothing special to approve this. 1GHz processor (cortex-a9!) for 2016 is just a joke. Even TI was getting on a15 at least. Meanwhile chinese vendors are getting on cortex-a72. I never understood this lagging. I think noone wants to spend 100+ $ for the board which should appear somewhere like ~5 years ago. And no ethernet. I heard due to internal bus restriction imx6 can’t manage GbE at full speed, so it’s even good that it’s moved on expansion header. In general – meh. i.MX6 is designed for industrial, automotive application, long term device available commitment. Even assuming that I don’t need the extraction tool, I would have to add the cheapest shipping option they offer to Germany ($37.04 if I only ordered the board, $44.30 if I ordered the board and the three antennas mentioned above; WTF? ), the board together with the antennas, would cost me $245.22 (including shipping and import tax). To boot, according to their web shop, the $99.50 for the board is an introductory price with $129.95 being the standard price. So, sadly, not a deal for me, since the board specs are actually pretty nice. But I wouldn’t pay more than a total of, say, $150 for the whole package, and this is $95 too much at the introductory price level and would be $131 too much at the standard price level. it’s cool and stuff and what makes freescale look respectable. still it in no way does validate such an overpricing. i think. TI’s sitara of am5xxx also are suitable for that use and have the same “long term device availability commitment”, but it has a15 inside (still costs pretty much though). yah, I meant this, I was wondering about how fast ‘freescale’ label is disappearing. Compaq has been bought by HP in like 2002 and even now it’s not rare to see ‘compaq’ labeled laptops.) It’s just kinda frustrating, what the new owner will be doing with the ppc architecture. I’m interested in those, don’t want they discard it.